Trout Stats: Major Trout is 146 mm (5.75 inches) in length & currently weighs in at 31.5 grams (1.11 ozs). Being an occasional angler, and with my mother playing an integral role in the stewardship of Harper Park, I found this cause to be right up my alley. The name Major Trout seemed appropriate as I have 8 years in the Canadian Armed Forces. Currently posted to Petawawa, ON, there are plenty of areas for fishing and boating, and many of my co-workers are passionate about fishing. When this opportunity arose, I called upon my fellow anglers, and they answered my call to duty pitching in to sponsor Major Trout. The Corps of RCEME, Royal Canadian Electrical and Mechanical Engineers -Electronics-Optronics crest. Researchers know that brook trout spawn in the fall. And, for resident brookies – those that live in the stream year round – spawning is largely triggered by a decrease in water temperature. Unfortunately it is difficult and expensive to monitor individual stream thermal regimes in natural settings, even though knowing when spawning is about to occur would allow wildlife mangers to ensure that the trout, and their habitat, are better protected when they are at their most vulnerable. 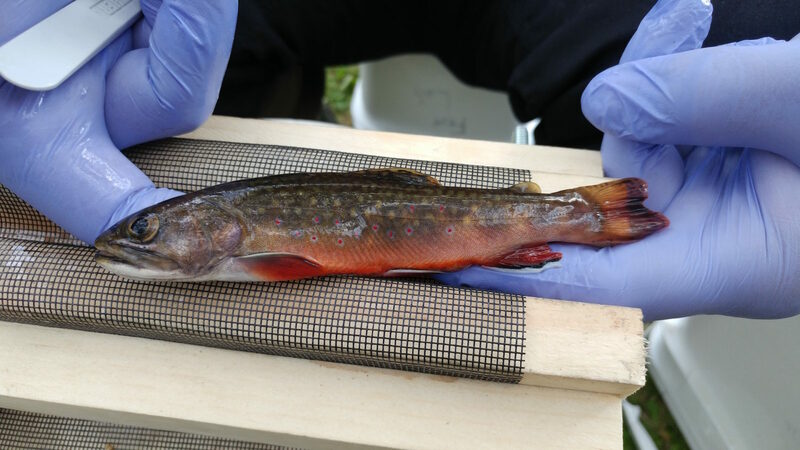 The need for a better environmental indicator to predict spawning led to an innovative study in Québec, Canada, research that looked at another natural fall change, leaf colour, to determine if colour change correlates with brook trout reproductive activity (Pépino, Proulx and Magnan, 2013). The study area was situated within the boreal forest where yellow predominates in the fall. Using the number of redds (egg nests) as a proxy for spawning activity, scientists discovered that in the same week that peak leaf yellowing occurred, the number of redds peaked as well! The synchronicity of trout redds and leaf yellow still needs to be tested across the species range, particularly since tree species vary over the geographical range of brook trout, but this is a promising discovery that could help alleviate recreational, development and fishing pressures on brook trout so that this most important of biological processes can proceed undisturbed by human influence.